We have a whole team of Paraplanners in-house here at Four Oaks Financial Services. We bet you are you wondering what a Paraplanner does. Most people have never heard of a Paraplanner, but they provide a vital support role to our Financial Advisers who provide financial advice local to Tamworth and the wider Midlands region. With the help of John Smith, our incredibly knowledgeable Head of Paraplanning, we’ve created a document for you to download. This explains the role of our Paraplanning team and how they work along-side our Financial Advisers and Customer Support Team to ensure all of the technical aspects of a client’s investment are completed and approved. 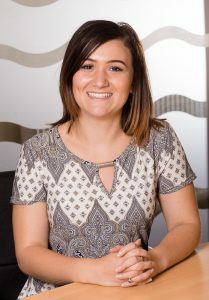 Senior administrator Emily Walker, has taken on the role of dedicated Client Support for Financial Adviser Ian Cleghorn. The purpose of Emily’s new role is to ensure that the very high level of service enjoyed by Ian’s clients continues. 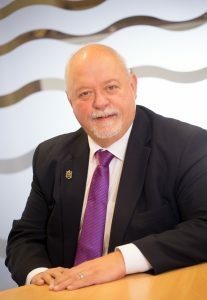 Ian is one of the most highly qualified advisers providing financial advice in the Lichfield area. 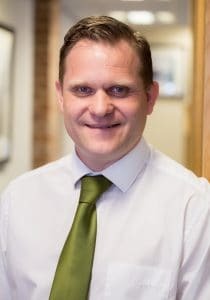 As a Chartered Financial Planner and Fellow of the Personal Finance Society, Ian has distinct qualifications and experience which means that unlike most advisers, he is able to work on certain kinds of complex cases. 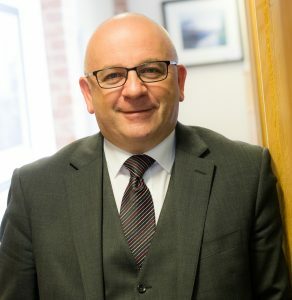 With an ever-increasing number of people entrusting their financial planning to Ian, his challenge is to make sure that he continues to provide an excellent level of ongoing service to all clients – some of whom he has worked with for more years than he and they choose to remember! Ian is now supported by Emily who expertly deals with the copious amounts of documentation, freeing Ian to work on casework, meet with his clients and concentrate on providing financial advice in Sutton Coldfield and wider area. Emily moved from a senior administrative role within our Client Support team to become Ian’s dedicated support person. This move also provides a career path for Emily ensuring that we are able to keep our very best people within Four Oaks Financial Services. Ultimately, keeping this depth and breadth of knowledge within our team guarantees an unrivalled financial planning experience for our clients. The R02 qualification on taxation is one of the hardest to pass, but Charlotte has done it! As a member of our in-house Training Academy, Charlotte has been studying for this exam since January. She was supported on a weekly basis in her studies by her colleagues in the Academy meeting each week, as she tackled the course material comprising 10 chapters each of 50 to 60 pages on all aspects of taxation. Charlotte has a pivotal role at Four Oaks Financial Services as Head of Client Support and she is also a busy mum, so packing in all the study and revision is a big commitment. We are delighted that she has passed. The examination is time limited to 120 minutes and tests not only the candidate’s knowledge but their ability to perform correct calculations. 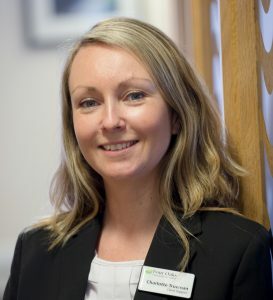 In her role as Head of Client Support, Charlotte and her team provide essential support to our team of Financial Advisers providing financial advice in Tamworth and wider area. Warm congratulations on this achievement Charlotte. We recently held our second annual golf day, and we took this opportunity to raise much needed funds for our charity Buddy Bag Foundation. We invited Buddy Bag Foundation to give a short presentation on their work which annually helps thousands of children who find themselves in womens’ refuges with no belongings. Our golfers and other guests raised £440 which will directly help 17 children in the UK. Our Financial Advisers who provide financial advice local to Lichfield and across the Midlands, and our entire team are very supportive of Buddy Bag, having given their time on numerous occasions to physically pack Buddy Bags, as well as donating money and sourcing the contents of the bags. Buddy Bag Foundation has delivered 14,250 Buddy Bags to date. Their goal is to achieve 20,200 bags delivered to children by the end of 2020. 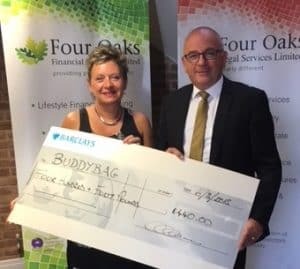 All of us at Four Oaks Financial Services will continue to donate our time, money and skills but if your organisation would like to find out more please visit the Buddy Bag Foundation <link to https://buddybagfoundation.co.uk/> website or ask one of our Financial Advisers for the charity’s contact details. Have you ever wondered what your Four Oaks Financial Services Financial Adviser does every day? We asked Ray Ceairns, one of our most experienced Financial Advisers what he does on a typical day, and found out that there is no such thing! We also found that the role of an adviser is much wider than our client’s might expect. For example liaising with a care home provider and attending a case conference with the client and care provider. To find out more about the role of our Financial Advisers, follow this link to download A Day In The Life Of A Financial Adviser. 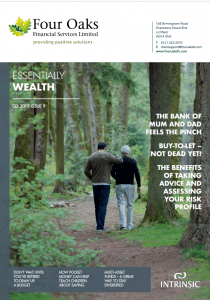 Four Oaks Financial Services provides local financial advice in Lichfield and the surrounding areas of Sutton Coldfield and Tamworth. 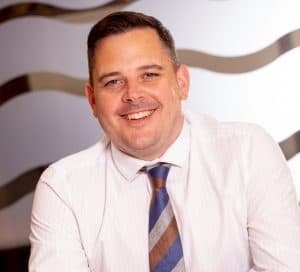 Huge congratulations to Financial Adviser Nic Whittaker who has passed one of the most difficult professional exams, first time. Nic has passed the AF7 exam on Advanced Pension Planning. The course syllabus covered detailed pension planning including Defined Benefits and Final Salary Pension transfers. Nic, who provides local financial advice in Lichfield and wider area, has been studying for six months in preparation for this exam that has a pass rate of around 43%. He has been studying for 10 to 12 hours per week and has also spent an additional four hours per week with his study group. Passing the AF7 exam is another step for Nic along his journey to become a Chartered Financial Planner. He has another three AF examinations to pass and he is planning to do this within the next two years. Well done, Nic. The Bank of England has raised interest rates for the second time in 10 years. The rate has gone up a quarter of one percent (0.25%) to 0.75%). 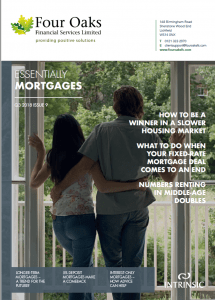 This is a great time to contact your Four Oaks Financial Services Adviser in the Lichfield area for a savings and investments review, or if you have a mortgage and are concerned about this interest rate increase in any way, we are here to help you.